Christmas has to be one of our favourite times of the year to get creative. As well as knitting our very own Christmas jumpers featuring motifs and baking our own mince pies dusted with icing sugar, we love to have a go at crafting our own decorations. Not only will home-made festive fare show off your skill with a pair of needles, it’ll also add a truly personalised touch to your house over the winter holiday season. Not sure where to start? 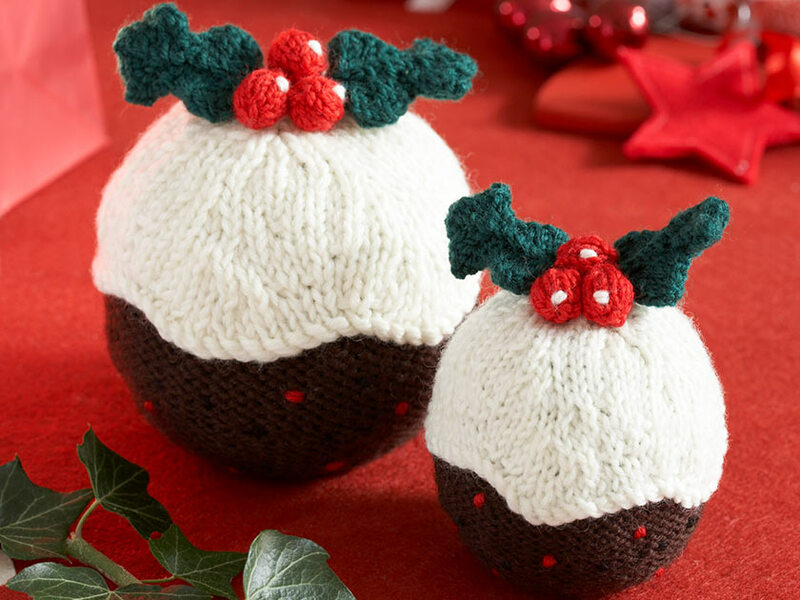 We suggest having a go at making a couple of cute Christmas puddings. Deliciously plump and topped with white wool to resemble a thick layer of creamy icing, they really do look good enough to eat. Emerald green sprigs of spiked holly and a trio of juicy round scarlet berries give our classic Christmas pudding pattern a wonderfully authentic finish. Proudly display them alongside your Santa Claus, red-nosed reindeer and scarf-clad snowman on the fireplace or consider using them to nestle among platters and serving bowls filled with food on your dinner table. They’re sure to be a real hit with any visitors who drop by your house in the run up to 25 December. To order your copy of the Christmas Pudding Decoration Knitting Patterns duo, simply click link on the name of the product. The reference code for this item is WHD078. You’ll just need to decide whether you’d prefer to print a PDF of the knitting patterns at home or have them posted out to your house. If you choose the latter option, you’ll be able to get started on this fabulously fun and festive project as soon as the postman pops your Christmas pudding pattern through your letterbox. View all Woman’s Weekly patterns at The Knitting Network.